If you need to get a Moldovan passport photo or visa photo taken in London, Reload Internet in Paddington is the best studio to visit. 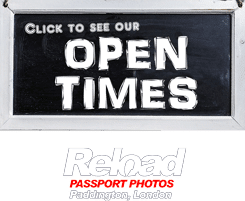 We are a professional passport photo studio based in Paddington on Praed Street – the same street as Paddington train and tube stations – that takes hundreds of passport and visa photographs every week. One of our experienced and professional staff members will take your photograph and print it out instantly according to the requirements stated by the Embassy of Moldova. You do not need an appointment to have your Moldovan passport photo or visa photo taken by us, just visit our store and a member of staff will be happy to help you. The process will only take around 10 minutes, so you can carry on with your Moldovan passport or visa application straight away. We are open seven days a week at Reload Internet, from early in the morning until late into the evening, so you can come and have your Moldovan passport photo or visa photo captured and printed at a time that suits you. We are extremely accessible, due to our location being so close to Paddington Tube station and train station, and offer affordable prices. 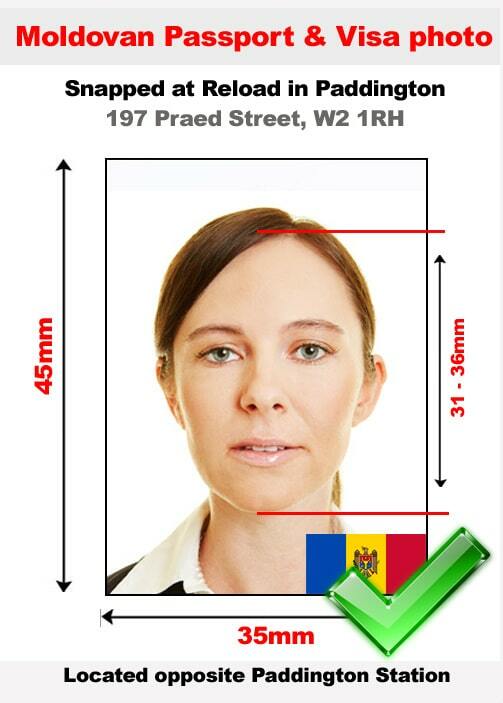 For a set of 6 Moldovan passport or visa photographs, we charge just £9.99, and these photos come with a guarantee to pass first time with your Moldovan passport/visa application. Our staff have been trained to use the latest camera and printing tech in order to provide you with a set of high quality photographs that meet all of the requirements set by the Embassy of Moldova. We will ensure that your photographs will pass at the Embassy before printing them, so you can be safe in knowing that the photos you submit with your application will pass first time. Your Moldovan passport photo or visa photo must meet all of the specifications stated below, if it does not then there is a high chance that it will be declined when you submit your application. This will cost you time, money, and could affect your travel plans. At Reload Internet we guarantee that this will not happen to your application, as we will get your Moldovan passport photo or visa photo correct the first time! The photographs must be sized at 35mm x 45mm and printed out on photo paper that is high-quality with a resolution of 600 dpi. Your chin to the crown of your head needs to measure between 31mm and 36mm. When you get this photo taken, you will need to look directly at the camera while keeping a neutral expression without showing your teeth. The image must show the features of your face clearly and have a sharp image with the right level of contrast. You cannot use any images that have shadows, red eyes, or reflections. Glasses frames cannot obscure your eyes, or the photo will also be rejected. You need to have a neutral background and one without any clutter. Your skin tone must appear natural and the photo cannot be damaged in any way. The camera must be at eye level when the picture is taken. Your head must be straight and looking directly at the camera so that it can capture your entire face. This image cannot be portrait-style, where your head is tilted or the photo is taken at an angle. The camera needs to be able to capture your entire face evenly to help with recognition, so a straight-on camera shot will ensure that you get both sides of your face. In normal circumstances, images with headwear will not be accepted. There are exceptions to this if the headwear is necessary for religious, culture, or medical reasons. If this is the case for you, you will need to provide certified documentation along with your application to prove that you need to wear the headwear. The headwear must not cover your face or cast a shadow that obscures your face. Glasses are also typically not accepted, though they can be allowed if the frames do not cover your eyes and they do not create a reflection when the photo is taken. The photographs must be an original photo. These cannot be altered or manipulated in any way. It can be tempting to remove any fine lines or imperfections in your face, but these are features that are necessary for these official photos. If there is an infant or another minor, there cannot be any sign of any supports holding the child in the image so those supports must be out of frame. Should you Moldovan passport photo or visa photo fail to meet any of these requirements, then it is likely that your application will be rejected when you submit it to the Embassy. At Reload Internet we guarantee that the photographs you receive from us will pass first time along with your application. We receive our specifications from the Embassy of Moldova’s guidelines on passport and visa photographs, which can be found here.